It is sad but true that we now live in a world we have poisoned so comprehensively that air, water, earth, in fact the whole environment, has been majorly compromised to the extent that a nutrient-filled and balanced diet is almost impossible to attain from food alone. On this occasion we are not going to discuss our on-going pollution of the planet nor its consequences. This is well documented elsewhere and for those wishing to explore that subject further there is a plethora of evidence which awaits your scrutiny. Our point is to state without apology that we are living in unprecedented times, when we can no longer guarantee the nutritional status of our food, because the nutrients that were once in the soil are now either at marginal levels or simply not there! Once again we urge you to do the research for yourself and you will see that in 1936 there were well over 70 trace minerals that could be found in abundance in the soil just about anywhere; now it is not uncommon to find less than 20 minerals and in some instances due to pollution and over-farming those numbers drop to single figures! We now face the almost impossible task of trying to live nutritionally rich lives, which would give us our full biological potential and provide us with sufficient immunity to fight the many degenerative diseases that have become commonplace, whilst current global shifts and changes make that harder by the day. So how on earth do we bridge this nutritional gap? … Sadly at this point in our history all we really have are supplements of one kind or another. For us, at Reach, we would describe supplements as a regrettable necessity. It simply is not natural to be popping handfuls of pills every day; we were not designed for that form of nutrition. Nutrition should come from our food, as that offers the best configuration of proteins, fats, carbohydrates and micro nutrients in the right biological context and proportions. No supplement is going to deliver the 700+ nutrients that can be found (for example) in broccoli or cabbage, and even if it could, matching the nutritional proportions and configurations would be impossible. We simply have to concede that nature does it better. She has a wisdom and sophistication we just do not have. So given this gloomy picture what should we do? Well firstly do not make the mistake of being seduced by supplement companies who offer an ever-increasing selection of products for every ailment on the planet! We now have a confusing picture where more companies than ever before are offering ever greater choice. If you were to believe and act on all the literature available, you would be sitting down in front of a plate of supplements three times a day! Now we live with the promise that for every condition there is a supplement to fix ‘this’ or ‘that’, so many claims in fact, that it has left the consumer baffled as to what action to take. We have reached the point in nutritional medicine where the ‘magic bullet’ approach of allopathy (modern medicine), has been slowly adopted. We are not condemning allopathy, or its place in medicine, because when allopathy works well it works exceptionally well. However, in our view, it does over-reach itself, acting at times as a supreme arbiter of medicine and anything which stands outside its perimeter is viewed with scepticism; allopathy has also developed a philosophy where it usually looks for just one thing (the magic bullet) to address a problem. This approach does not adequately take into account the multi-factorial nature of disease and therefore the multi-factorial response needed to alleviate our many biological dysfunctions. 1. Eat the best diet available to you, ensuring you get an abundance of vegetables. Although fruit is important too nothing beats green matter for acquiring the 90 nutrients and the hundreds of micro-nutrients needed each day. It must be remembered however that without a laboratory in your kitchen one never truly knows how much of these wonderful nutrients are actually being imbibed but as far as possible buy the best food stuffs you can afford. 2. Remember we are vertical rivers and the enormous number of jobs carried out each second to keep us alive depends on water. So do not compromise on water, this most precious of all the nutrients. Without it supplements are never fully broken down, distributed and absorbed, so they are next to useless in the absence of water. 3. Never make the mistake of simply self-diagnosing. To pop supplements having just read an article or as a result of anecdotal evidence is unwise and could be unhealthy too. As previously stated supplements are a necessary evil and so one should proceed with caution. It is always best to get advice from an appropriately qualified and experienced nutritionist. Natural nutritionists, herbalists, phytotherapy practitioners and naturopaths are most likely to take a holistic view when supplements are being used to put right biological dysfunctions. 4. 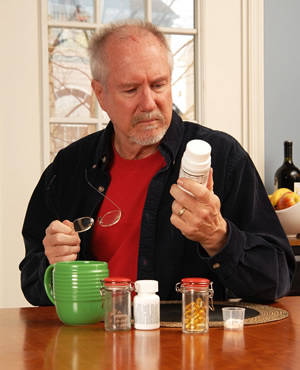 It is important to point out that supplements whether herbal, vitamin or mineral based are not all the same. Purity, the processing of the product and chemical constitution are all highly relevant. Wherever possible choose ‘Food State’ products, i.e., nutrients produced from food stuffs rather than synthetically generated in the laboratory. Supplements manufactured in laboratories as a result of clever biochemistry only survive in the body for around 18 hours, whereas nutrients generated from a food product will thrive in the body for days. This is due quite simply to the beautiful biological match that occurs within our bodies when using food state products. 5. When looking at your state of health, remember a mind-body-spirit-environment approach is needed (see: Story of Health 1,2&3) and so supplements alone will never be sufficient. This is true when drawing on other bodily interventions, such as: acupuncture, homeopathy, kinesiology, reiki, E.F.T and many other healing modalities. Strengthening the body and its functions using these methods is a good start but it is rarely enough to achieve holism and well-being. 6. Last but not least, having taken sound advice, a good supplement regimen is best built around your lifestyle, diet, genetic propensities and vulnerabilities. We are essentially the same, but there are important biological idiosyncrasies and these should not be ignored when planning what would best meet your needs. Some professionals use diet sheets, symptomology and experience to plan a regime, whilst an increasing number are now using machines and various computer aids and programmes as part of their diagnostic approach. There are strengths and weaknesses in both. In the end, trust in the practitioner, their body of knowledge and experience will prove to be the most important factor. So research well and see what approaches and interventions you are most drawn to and then proceed bearing this summary in mind … Wishing you health and peace of mind.